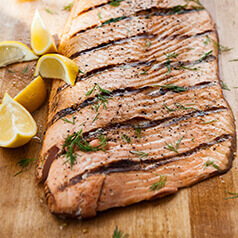 This delicious salmon recipe is packed full of protein and healthy omega-3 fats, which most of us don’t get enough of. Use this recipe as a guideline for cooking other fish by simply swapping out salmon for a fish of your liking. I like that I can use this recipe year-round and have the option to cook on the grill or bake in the oven. Either way, it turns out moist and flavorful every time! Place salmon in center of parchment paper. Arrange carrots and celery around salmon. Sprinkle with olive oil, lemon juice and top with dill. Seal parchment butcher-wrap style. Place on baking sheet or glass bake ware. If cooking on the grill, place directly on the grill. Cook for 18 minutes or until parchment or foil is steaming, but not dry, and fish flakes easily. Tip: Add other vegetables such as onions, mushrooms, and peppers. Serve over brown rice, quinoa, or grilled corn on the cob.